Teal and Kraft Card and Espresso and Ocean tides ink pads, button and twine and twill tape a bit of blending, a boat scene stamp, Nestabilities label dies an argyle embossing folder and a water brush all helped to make this card. Most of the image was water coloured but for those eagle eyed amongst you, you will see the edging to the Argyle Embossed Kraft card and the shading below the boats, this was both done with Promarkers. The Boat scene stamp has no maker on the side of it, it was bought a few years ago at a craft fair. The other stamps (Compass and round swirls ) are from the Father Knows best stamp set by PTI. Как красиво! Впервые вижу такую красивую, тёплую открытку на морскую тему! This is a stunning card- love the stamp but best of all- love the colors and layout! Your cards are always wonderful.! You have an eye for detail. The hemp twine on the card, and in the circles. Very creative touch. I even love the compas. Beautiful card! It reminds me of the picture I won tonight at an auction. Love the ocean and everything about it! This is a really beautiful card. Love the boat scene. What a fantastic card! I love all the wonderful details you've included. Beautiful card Jak. love the colours, ideal for a man. Sooooo...this is a beauty of a card. It is really gorgeous. It's slightly different what you used to do but it's stunning. Corrr!! This is stunning, Jak!! I love everything about it...the colours you have chosen for this and the beautifully coloured image are gorgeous. Beautiful card Jak. Reminds me of Whitby. Oh I can`t wait for my hols lol. Jak, this card is stunning and reminds me of your cards of old. Love the colours - so vintage. A beautiful card Jak. I love the colours and the vintage feel. The image is fantastic!! That's a wonderful card Jak - such a subtle blend of colours. Brilliant card Jaks, love the vintage look. Your cards never fail to inspire me. This is a very calming view & one I would love to be able to replicate, if only half as good. Jak, that is one beautiful card, I don't know where you get all your ideas from, but keep them coming because they give lots of inspirations to the rest of us. That card is sensational Jak. Love those colours and the muted scene. Absolutely beautiful. Many thanks for showing it! Fabulous card Jak, love the image and the muted tones. Great card Jak, I love the boat image and it would be perfect for gents too. That card is so beautiful. I love the color combinations. Could you please tell us the name of the stamp company. I love all things relating to the sea and would love to add that to my collection. Love you cards. I love your cards. They are such elegant. Stunning! I love the way you've used the colours in this card Jak. Jak what a stunning design. I love the colours. A wonderful male card, love the twill tape it looks almost as though you are there ! This is such a wonderful masculine card, and it's so great as it has embellishments that stay in the masculine theme, I find it so hard to find masculine embellishments. Lovely card Jak such a peaceful scene/. Love it, Love it Jak. Stunning card in lovely sepia tones done to perfection. The blue button just pulls your eye into the card. I love it Jak and would love to be in the draw for a chance to win it. Fabulous card for a man. Love the vintage look. Wish I could achieve such great cards, they are very inspiring. Thank you for sharing. Lovely peaceful card, great colours. This would be a great masculine card! Love all of the effects! I would be so happy to win this card! That is a magnificent card, just love the colour, and the extra details you have added! Fabulous!! This is stunning! I just love the colors and the way you put it all together... Amazing! I love the sepia colour tones on this card. As others have said, great for a man's card - so hard to do! You have made a stunning card, i love the image and the colours you have used. You are such an inspiration. The boat scene reminds me of the old days before our family immigrated to Canada. My husband used to go fishing when the weather was good, only the two of us, when we didn't have any child yet. sitting near the rocky beach, we did fishing, life was claim and peaceful, it seemed that we were not in need of anything. What a lovely memory it brings to mind. Thank you for that little piece. Amazing card! Serene and beautiful! Another gorgeous card Jak, there is so much to take in and the colour combination is just fab. What a gorgeous card, love the colours and layout. Beautiful card! I love the stamp you have used! This is stunning, love the compass! Another beautiful card. I always love the colors you use. Even if I don't have the stamps, they help me to design using the same format. Wow -- this card is right up my alley. I really like the combination of teal and brown as well as the boat scene. Lovely work! and i love the look the cord gives to the whole card! Jak!!! It´s so difficult to do a man´s card and you did it with maestry!!! I love all the details you did and the colors are lovely!!! This card is really beautiful and I love how you've used the "rope" there. Wow! I have no words! very-very beautiful! Wow, wow wow! This card is amazing! 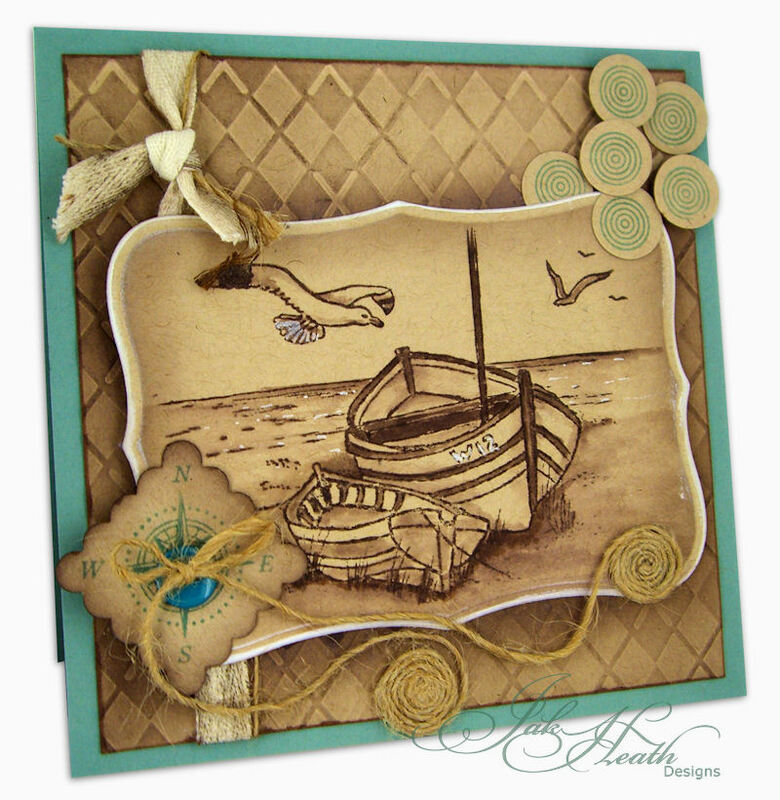 I love the textured background, and beautiful boating scene. Absolutely love the colours, shading & the originality of this & then there's the texture, I just keep seeing more in it. It immediately reminded me of Seagull book by Bach. What a beautiful sketch! Great card Jak, love the monochrome look of it. It's ideal for someone down here by the sea. Wow, great work on this card. I love the use of the twine here, it adds such a unique texture to the card! What a fabby themed card - I love nautical themes - prob because I like being by the sea - i think its my destiny!!! The colours, the twine etc really lend themselves to the theme well - love it.